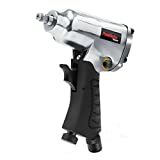 PowRyte 1/2-Inch Twin Hammer Air Impact Wrench is perfect for tire rotation, brake repairs, exhaust repairs, and the loosening or tightening of any other bolts. Hard hitting twin hammer provides reliability and high torque output. 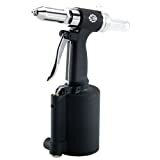 It has an adjustable torque regulator with 2 forward torque settings and 1 reverse setting, and the forward/reverse control makes it easy to switch directions. With easily adjustable torque controls, it allows you to have variable adjustments with forward and reverse settings. It also features an ergonomic handle, a ring type retainer, and built-in silencing reduces noise level. Recommended hose size 3/8 in. Save Most Live Best. With Eosmos’ innovative company structure and advanced native management system, we save your money in every step of our operation, with a guarantee of high-quality and reliability. We deliver the most saving and best value to you. Shop now with PowRyte and you will never worry about overpaying anything. Specifically designed for entry level DIY workers, PowRyte tools maximizes your saving by delivering quality tools with the LOWEST PRICES throughout the market. 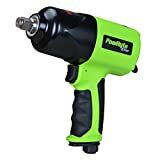 PowRyte Elite 1/2-Inch Composite Heavy Duty Air Impact Wrench (Twin Hammer) is perfect for tire rotation, brake repairs, exhaust repairs, and loosen or tighten for any other bolts. Composite housing with a contoured grip is specially designed for your comfort! Hard hitting twin hammer provides reliability and high torque output. 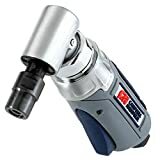 It has an adjustable torque regulator with 3 forward and 1 reverse torque setting, and the forward/reverse control makes it easy to change directions. It also features a handle exhaust, and a built-in silencing. PowRyte Elite’s expert product development team guarantees ingenious, innovative, and ergonomically-designed products for serious level DIY workers. PowRyte Elite’s products will be necessities that make your life easier and more efficient. Air Inlet Size: 1/4 in. Recommended Operating Pressure: 90 psi. Housing Material: Composite. Color: Red/Black. Maximum Output: 400 ft./lbs. Assembled Height: 7.5 in. 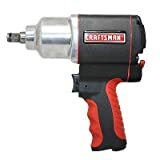 This lightweight composite impact features a hard hitting oil lubricated twin hammer hammering unit that produces over 580-Foot pounds of torque. The double injected comfort grip and ergonomic throttle design provide added comfort. 10 pc. kit includes 3/8 in. ratchet wrench, 1/2 in. 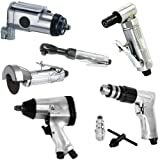 impact wrench, air hammer and 3/8 in. 25 ft. air hose – plus accessories. Torque Maximum: 230 ft. lbs. 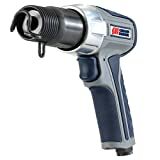 Dynamic Power 1/2″ Air Impact Wrench (Rocking dog mechanism) is perfect for tire rotation, brake repairs, exhaust repairs, and the loosening or tightening of any other bolts.Hard hitting twin hammer provides reliability and high torque output.Bulit-in power regulator to control speed and torque. Single handed operation for forward and reverse direction changes. Has Four position power settings. At 240 ft-lb. of torque, provides power to remove most lug nuts. 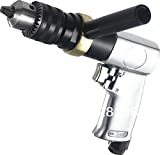 The Astro Pneumatic Tool 1822 1/2″ Nano Impact is the latest in mini lightweight impact development. At only 3.85″ long (or about 1/2″ longer than a credit card), the twin hammer 1822 Nano Impact is deceivingly powerful, registering a max of 450 ft./lbs. of torque. The 1822 was designed to be extremely light (3.0lbs.) and well balanced when connected to an air line, and operates in 3 forward and reverse speeds. Featuring a twin hammer design for increased reliability, and coming from Astro’s robust ONYX line, this impact has more than just the numbers behind it. 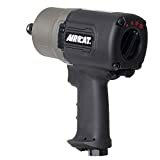 The AIRCAT 1076-XL is a 3/8″ drive composite, compact impact wrench. Weighing only 2.5 lbs and 4.25″ long, the 1056-XL produces 550 ft-lbs of torque. It has a Jumbo Hammer mechanism made from triple heat treated Ni-Cr-Mo alloy steel for power and reliability. There are several patents on the 1056-XL – The AIRCAT style grip for comfort. The silencing technology that reduces the noise down to 85 dBa. And the trigger mounted combined F/R switch and power management switch. All this in a Kevlar composite housing with the standard AIRCAT 2 year warranty. 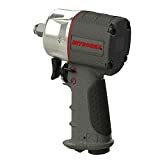 PowRyte Basic 100101 3/8-Inch Air Impact Wrench is perfect for tightening and removing bolts in small areas, such as light engine work, small engine repair, tire rotation and light construction. 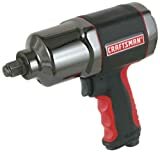 It has a double ball bearing construction with a reliable single hammer impact mechanism, and comes with 4 torque settings up to 120 ft-lb and its weight is less than 2.35lbs! Plus, its efficient air motor reduces air consumption to save you money. 11000 RPM (Free Speed @90PSI) helps provide high power fastening. The ergonomic handle provides improved comfort and control for the user. It includes a convenient single forward/reverse switch for one-handed directional changes. With easily adjustable torque controls, it allows you to have variable adjustments with forward and reverse settings. It features an air pressure of 90 PSI and a 1/4″ NPT air inlet with screened filter. This tool includes a 1/4-inch NPT air inlet fitting and owner’s manual. Contents: Ratchet Wrench, operation and parts manual. PowRyte Elite 3/8-Inch Composite Air Ratchet Wrench is perfect for removing and tightening nuts & bolts and engine & radiator maintenance. The forward/reverse rocker switch is ideal for Instant Change of Direction. The easily adjustable regulator combined with feather touch lever offers unprecedented control. Composite handle ensure operator comfort even during extended use, and insulates from the cold. It features a 360 Degree directional air exhaust for redirecting air away from the user. The ball type socket retainer is perfect for secure socket retention. 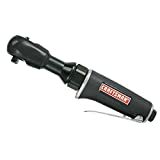 The Mini Ratchet Wrench is yet another powerful air tool from Craftsman. 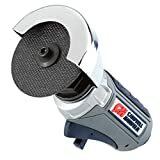 This tool features a lightweight composite housing and ergonomic throttle lever design for comfort while the unique sealed ratchet head design prevents the ratchet head from spreading under extreme loads. Tool produces an astonishing 20-Foot pounds of torque, 250 revolutions per minute free speed, and only weighs 1.6 lbs. This tool offers a twin pawl ratcheting mechanism which provides smooth and consistent operation. Tool also features built in silencer and rear exhaust that greatly reduces tool noise. A laser etched size indicator ensures you grab the right tool every time. The Astro Pneumatic 1125 1/4-Inch Stubby Air Ratchet Wrench is the ideal tool for working in confined areas, such as under dashboard work and small engine repair. Its compact and lightweight design features a special reinforced planetary gear made of “Micro Grain” powder by gas forging. It includes an internal ring gear with three planetary gears which provides maximum service life, a self-lubricated blade to prevent cylinder and end plates from wear as well as a built-in regulator. 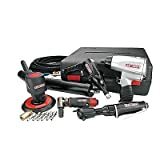 PowRyte Basic 100106 3-Inch Air Cut-Off Tooll is great for cutting mufflers, clamps, joints and bolts quickly and easily with material up to 3/4in thick. 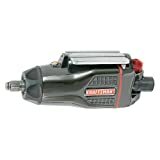 This air cutoff tool delivers 20,000 rpm needed for the toughest cutting jobs and has a recommended operating pressure 90PSI with a 1/4″ air inlet. The chrome-Plated steel guard protects you from sparks during operation. The built-in power regulator allows for precise control of the speed for multiple applications. An integral safety-lock throttle lever prevents accidental start up. The rear air exhaust helps blow exhaust away from work surface, and an air inlet with screened filter keeps out unwanted particles. 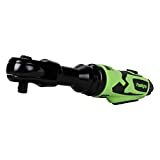 Astro Pneumatic’s 209 ONYX Inline 3-Inch Cut-Off Tool is uniquely designed to provide greater control and lock-out throttle protection. In addition, it features an adjustable protection guard, a chrome plated steel spark guard and variable speed control. The AIRCAT 6350 i8s a Low Vibration Compact Air Saw. 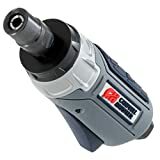 What makes the 6350 different than other Air Saws in this category is the low weight, low vibration, compact design with all metal blade retainer. We’ve reduced the vibration level by 50% for better control and the 6350 only weighs 1.12 lbs. Only 8″ long the 6350 can cut up to 3/8″ steel in a high volume/industrial application. The blade retainer is all metal – no plastic parts that will wear prematurely like other Air Saws. The adjustable rear exhaust keeps debris out of the work area. The 6250 comes with 2 blades each in 18T, 24T and 32T saw blades and can accept standard saw blades. At 9500 strokes per minute the 6350 is very fast and has an adjustable blade guard. The 6350 uses 3.5 CFM and like all air tools it is designed to run at 90 PSI at the tool with the trigger engaged. The standard AIRCAT 2 Year Warranty makes the 6350 the best tool in this category. 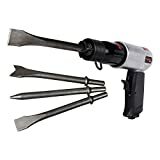 PowRyte Medium Stroke Air Hammer with 4 Chisels is ideal for cutting metals, shearing bolts and rivets and driving out pins used on cars, trucks, recreational vehicles and structural maintenance and repair! 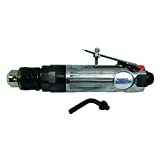 It comes equipped with a extra length cylinder is perfect for hardest hitting power, and alloyed steel barrel for a longer life and is powered by a heat-treated piston. The built-in power regulator allows for precise control of the speed for multiple applications. The coil spring retainer allows for fast-and-easy chisel changes. This air chisel also features a touch control trigger, and the ergonomic grip offers greater comfort while you’re working. 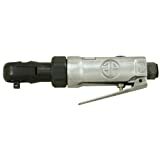 It includes 4 air hammer chisels (cold, ripping, punch and panel) for cutting metals, chipping and scraping surfaces. Save More Do More on a wide range of quality mechanical and electronics products. With PowRyte’s innovative company structure and advanced native management system, we save your money in every step of our operation chain, with a guarantee of high-quality and reliability. We deliver the most saving and best value to you. Tool can be loaded 3 ways:14-ounce cartridge, bulk filled or canister filled. 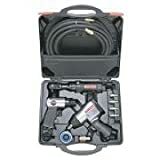 Accessory set-Accessories include: (1) 25 ft. Air Hose, (5) Male Couples, (1) Quick Connect Coupler, (1) Roll of Non-Stick tape and (1) Blow molded carrying case. 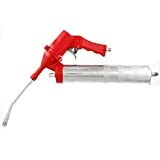 This air operated continuous flow grease gun is made with a heavy duty die cast aluminum head that is fitted with automatic air bleeder. It features a larger pumping chamber, honed for rapid operation. Includes 6 inch bent steel extension, easy access 24 inch high pressure grease hose and 3-jaw slim coupler. For use with 14 ounce grease cartridge. 4800 PSI. 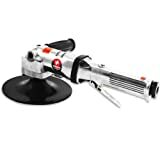 The Astro Pneumatic 3042 Pistol Dual Action Sander with Pad tool has female thread w/3″ male pad. Both are straight thread sha-Feet Specifications: Disc Size: 3″, Free Speed: 15,000rpm , Overall Length: 5-1/2 ins, Net Weight: 1.5-Pound, Spindle Thread Size: 5/16″*24 thread, Air Inlet Thread NPT: NPT-18, Air Hose I.D. Size: 3/8″, Orbit: 3/16″, Avg. Air Consumption: 5 cfm, Air Pressure: 90 psi. 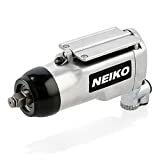 Neiko Pneumatic Air Angle Polisher Grinder Buffer 7in.